Betsocial: Home to the Best Odds for Players? Betsocial, an eGamingLab Ltd-managed sportsbook, has been providing hefty serving of betting odds for many sporting games. The betting site is running with two licenses: one is from Curacao government and the other from Malta Gaming Authority (MGA). This should give you peace of mind, especially considering that MGA is very strict when it comes to rules and standards. This is a big deal for you since any site that carries the license will need to make sure that your money is safe and that there is no way that you get cheated when wagering. However, the sportsbook does not accept anyone from the US. If you happen to be a US punter, there are still plenty of sports betting site that will let you register and make wagers. Can the betting markets and promos on Betsocial make you sign up and deposit money? Read through this review to find out. There are very few promotions available on Betsocial. And most of these are for the casino players of the betting site. If you are a first-time punter, you will get the 50% Sports Bonus up to €100. You can cash out the bonus credit after wagering the bonus and deposit amount about 10 times on any sports event with odds of 1.80 or higher. But keep in mind that you need to deposit at least €20 using a Visa or Mastercard to get this bonus. With only one promo for sports betting and with a meager 50% bonus with a max cap of €100, the gaming site gets a below-average score. The promotion is even worse for any punter because you can get this bonus only when you make a deposit using a credit card. 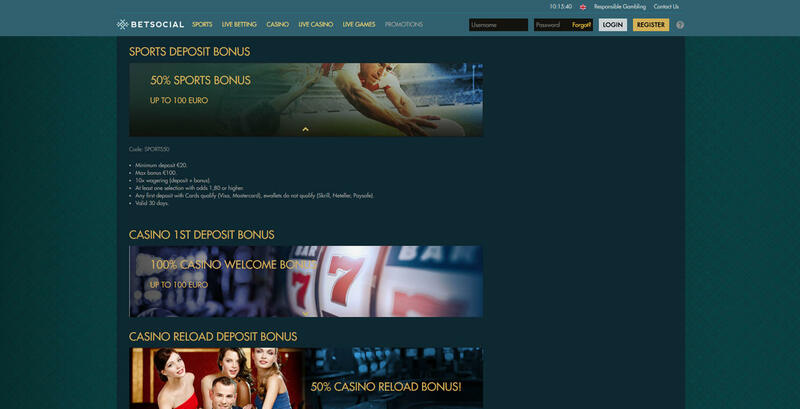 Betsocial is not like other online gaming sites that provide a variety of bonuses, including cashbacks and other Bitcoin sportsbook promos. You will find markets for popular sports competitions like Serie A, Australian National Rugby league, and NFL Playoffs. Plus, this online bookie gives you odds for motor races like Formula 1 and Tour De France. You can even find a good amount of esports coverage like the International and ESL Pro League. Betsocial is also rich in prop bets like Aggregated Total Goals or Correct Score for Champions League matches. Layouts of pre-game and live betting sections have clean designs that are easy to look at. In addition, the site gives you the option to change the odds format to decimal, American, or fractional odds to make the markets easy to read. If you are a crypto punter, you are out of luck with Betsocial because there is no option to wager here with digital money. What’s more, EUR is the only currency supported by the sportsbook. There are a decent number of fiat payment options available in this sportsbook. This gives Betsocial a better score than other gaming sites that have only two to three payment options. Another good thing about this online bookie is it imposes low minimum cash-out requirement, compared with other gaming sites that will not let you withdraw any amount lower than €100. The many ways to fund and cash out player’s bankroll on Betsocial may seem all right, especially when you are an EUR user. But if you want to make sports bets with your cryptocurrency without using Neteller, know that Betsocial is not Bitcoin sportsbook. Betsocial: Is It Worth It? What makes Betsocial hard to recommend is the fact that the bookie lacks crypto payment options and provides limited promotions to sports bettors. On the bright side, the layout of the betting site and betting market is presents are everything you want from a sportsbook. From the variety of sporting events to the option to change the odds format, you might find the right bet for your favorite game. You are also assured by the MGA license that your bankroll is protected by the regulation office. Overall, if you do not mind missing out on great bonuses or having to use Neteller to bet with your crypto, then this sportsbook is for you. 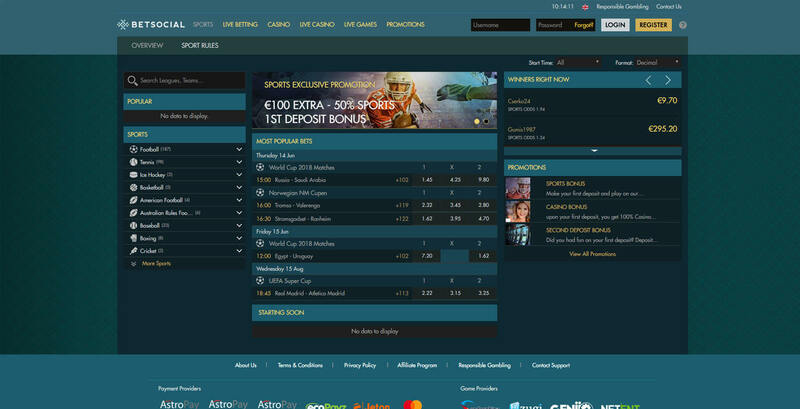 Otherwise, there are still other sports betting sites that are better than this one, especially those that provide many bonuses and let you bet directly with Bitcoin or other altcoin.